Leading fractional ownership super-yacht company YachtPlus this week launched the second yacht of its four yacht fleet in La Spezia, Italy. Christened Ocean Pearl, this stunning 41 metre yacht , identical to its Norman Foster designed sister yacht Ocean Emerald, will operate a series of cruises throughout the Mediterranean during the summer of 2010 and the Caribbean in the winter of 2011. “We are delighted with the response from the owners who spent this summer on Ocean Emerald and are extremely optimistic about the future of the next three yachts that will continue to grow the YachtPlus fleet. 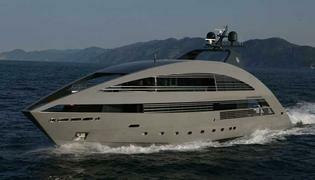 The many enquiries we have received over the past few months and the very positive comments from current owners is a testament to the concept of fractional ownership which is rapidly becoming acknowledged as the most financially astute way in which to own a super-yacht,” said John Hare, Chairman of YachtPlus. “These are challenging financial times and increasingly more people, many former sole yacht owners, are turning to fractional ownership as the most cost effective, stress-free and viable way to own a luxury super-yacht,” he added. This type of ownership allows members to maintain a prestigious and luxurious lifestyle at a fraction of the cost of sole ownership thereby freeing up capital for other forms of asset ownership. One of the major attractions of YachtPlus fractional ownership is that it removes all the hassles, concerns, unforeseen financial pitfalls and very substantial annual running costs incurred via sole ownership. The third yacht of the fleet, Ocean Sapphire is due to be launched in May 2010 and the fourth, as yet unnamed, is scheduled to enter service at the beginning of 2011. All four yachts, identical in design by world renowned architect Norman Foster, are being built at Cantieri Navali Rodriquez.